Yesterday, the local flock of wild turkeys decided to forage beneath my bird feeder. When all the "little" birds suddenly began looking down and flying off, I wondered if my neighbor's dog had made another appearance. Not. It was a flock of wild turkeys, checking out the spillage from the feeder. They stayed about an hour before wandering off into the woods again. So.......I went out on the balcony and "replenished" the dropped seeds. Lo and behold, they came back. An adult pair, with about 10 of this year's offspring. I think the adolescent turkeys are really cute -- all long necks and gawkiness. After a while, they left again, and I quickly "replenished" the seeds one more time. I was so amazed when they returned a third time in the late afternoon! This morning, they were at the other end of the yard. Our chicken coop is at that end, and we have a large screened enclosure for the chickens to use when they are outside. It is about 10 feet tall, 24 feet square. Several of the turkeys had flown up onto the top of the enclosure and were trying to reach the crab apple tree from its top. One could, but those who couldn't actually flew up into the crab apple tree to eat. The tree is perhaps 30 feet tall, but the slender branches near the top were never meant to hold the weight of 15 pound birds. The branches swayed and creaked, and the turkeys flapped and shuffled while they feasted. What next? I'm still in my sock-knitting phase and just finished this pair. 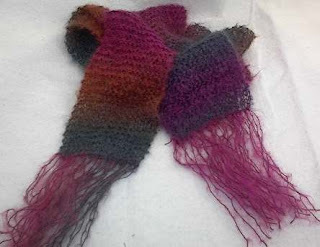 They are made from one of the self-striping yarns that are so much fun to work with. 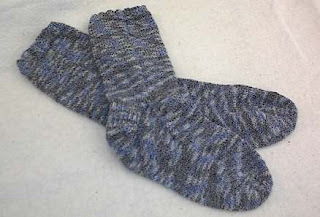 Ten minutes after finishing this pair, I had yet another pair cast on to my needles, to be knitted from OPAL yarn in a rose/cream/gray/purple variegation. I'll post those when I finish them. Its not that I'm just knitting all the time, either. Yesterday, I decided to work on some fabric postcards and created two of them. The first is on a base of yellow silk fabric, to which I stitched down a flower cut from some printed fabric, then heavily outlined with machine stitching. 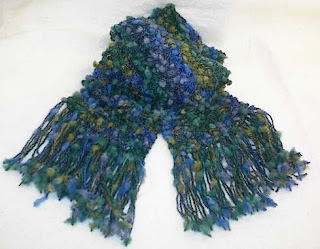 On top of that, I added some bits of wool teased from leftover scarf yarn and a bit of thread. 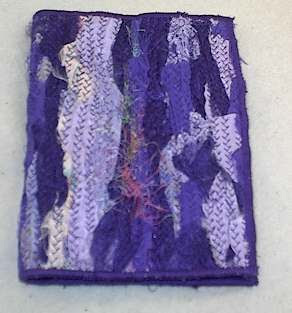 All were held down with tulle and machine quilted in waving lines. 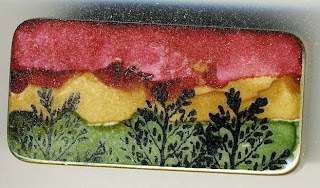 The variegated thread is a trilobal poly from Superior Threads. I am determined to learn thread painting, so the second one of them was an exercise on a small scale. 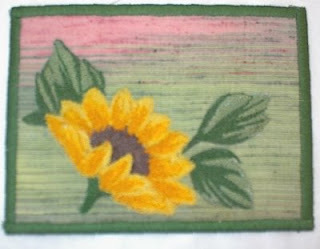 The sunflower and leaf motif is completely thread painted. 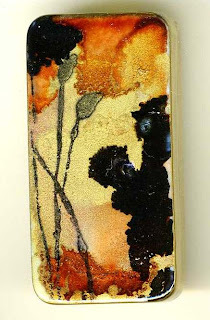 The wonderful background fabric is a scrap from a vintage kimono. The only "tough" part is constantly changing the thread colors on the machine. 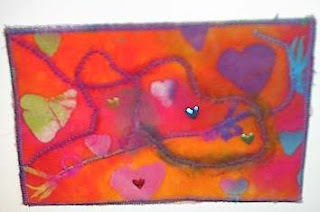 The "painting" is all done with tiny zig-zag stitches, so close together that they overlap each other. I want to get to the point where I can thread paint birds. The expected rain/snow/whatever never happened today, and I am very glad. This winter seems like it has been exceptionally long. Of course, the same snow that fell before Thanksgiving is still on the ground. With March just around the corner, and bits of muddy dirt beginning to show, I can finally believe that spring will truly come. Two weeks have passed since Ground Hog Day and the days are getting longer. The deep cold seems to be passing. Spring can't come too soon. The birdfeeder outside my studio window is constantly busy. When the weather was at its coldest, I had to fill the feeder twice a day. On a few of the most bitter days, three times. Now, I'm down to once a day. Another sign that spring is coming. The suet feeder is a popular spot for our many woodpeckers, and one enterprising squirrel who has figured out how to get three stories up and leap onto it. He breaks off pieces and throws them to the ground, then leaps and tumbles down after them. I had hoped to finish these bright red and purple socks to wear on Valentine's Day to my EGA Chapter meeting; I didn't quite make the deadline. I did finish them yesterday, though, and am already halfway finished with the first sock of another pair. 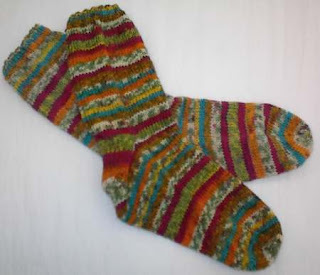 These red and purple ones were knitted from a yarn called "Soxx Appeal." 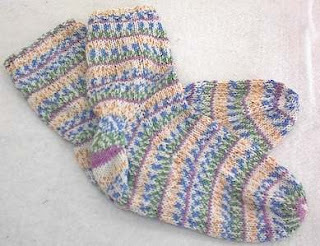 I found this elasticized yarn a challenge when I first started the socks -- it was tough to get the correct tension. I ended up having to go up a needle size -- to a size 3 -- just to get the guage correct. But they are wonderfully comfortable, and I love the bright color! The photo is much darker than the actual color of the socks -- they are eye-popping! The ice is slowly melting. The sun is bright, but the temperature seems unable to rise above 35 degrees no matter how much sunshine we have. The driveway is mostly in the shade (on the north side of the main house and the studio) so parts are not ready to thaw at all. I now have a couple of narrow paths where I can walk -- but none of them goes to my car. The car is still in the shaded area and the ice is still thick and smooth. If I ever win the lottery, I will have a new, heated driveway put in, using solar panels on the south facing slope of the roof to provide the energy. Then, I won't be held prisioner by the ice and my dreadful balance. I taught a mini-class in Shisha mirror application at Saturday's EGA Chapter meeting. No project, just working on various techniques for stitching down things that don't have holes in them. We did mirrors, paillettes (ignoring the hole), coins, tiny tiles. It is a good group and the class was fun. 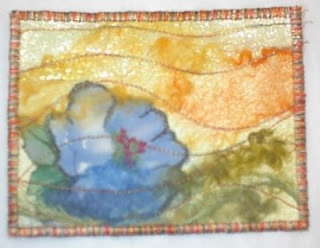 Tonight, the local sub-group of the EGA is meeting and I will be teaching silk ribbon embroidery. Did I mention that I've retired????? My mailbox held a surprise today: this terrific fabric postcard from a friend! What a perfect surprise to cheer up this blah day! Winter still has an icy grip on my driveway -- four or more inches of solid, rock-hard ice that is as smooth as an ice rink just groomed by the Zamboni machine. Several days of thaw/freeze/thaw/freeze cycles have perfected its mirror surface. Driving on it -- and it is a looooong driveway -- is scary. Walking is worse. I had to venture out to go to Physical Therapy this afternoon and had to wear ice cleats to make it to my car. Weeks and weeks of this ice (it has been there since the big ice storm in early December) are wearing me down. I dream of warm, tropical beaches and find myself humming Jimmy Buffet tunes. Will the thaw never come? It looks like it wants to rain or snow, dark overcast skies everywhere. Even with the forecast for mid 40s tomorrow and the next couple of days, the bare pavement is not likely to reappear as long as the temperature drops to below freezing every night. And in P/T, I had to lie on a cold pack for 20 minutes -- which did nothing to help with my winter blahs! My yard is not much better. Our house is on a steep slope and the snow in the yard is also rock-hard. I saw a squirrel slide 70 feet down the hill today, unable to stop even with his sharp claws. He finally stopped sliding when he hit a tree. Birds slide when they land. It's awful. OOOH! Bahamas! So......when I checked my mail and got Cheryl's card in all its cheery, warm colors, my spirits were instantly revived and the day was saved. Thanks, Cher! Time flies! I have been so remiss in getting things up and onto the blog. Wow, nothing since September...so a not-so-brief catch-up is probably needed. In October, the highlight of the month was a four-day trip to NYC. We saw three operas at the met in one weekend. What a treat! Madama Butterfly, Lucia di Lammermoor, and Doctor Atomic. All were spectacular. In between performances, we sampled lots of great food. You cannot go hungry in New York unless you really try. We didn't even try. We had bagels from H and H, great pastrami from Stage Deli, fabulous Indian food at Madras Mahal, Mexican, and snacks from street vendors. Lots of walking, too, and the weather was just perfect most of the time. Getting to the City is so easy on Amtrak...and so relaxing. Our son, who lives in Oregon, joined us for the long weekend and we really enjoyed being with him. 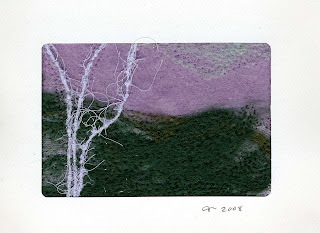 This card is had-felted wool, a deep sunset impression. 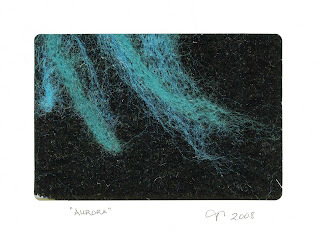 This one is an impression of the aurora borealis, done for a friend who lived many years in Alaska. 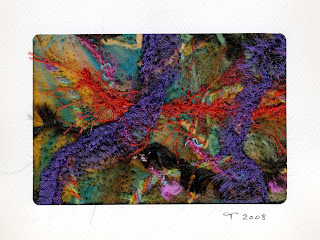 A collage of wool, felts, ribbons, fabrics. 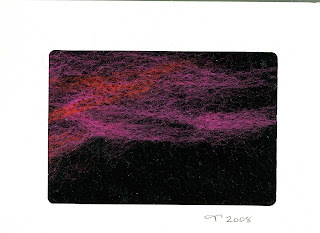 Another felt and fiber collage. I've been busy with other work, too. I've made dozens of scarves. Here are two of them. 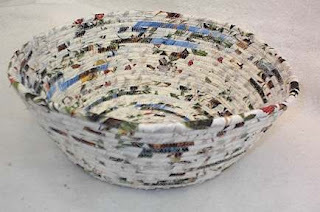 And a big basket (14 inches across, 6 inches high) to hold my current knitting projects.